Brothers in Christ are people (men and women) who feel they are like brothers and sisters of each other, with the common faith in Jesus Christ as their leader and their mediator as resurrected son of God. Not believing in a tri-une god (the Trinity) they believe Jesus really died (remember God can not die) and was taken out of the dead to sit at the right hand of God to be a mediator between man and God. Throughout history there have been many men and women who only wanted to follow the teachings of Jesus Christ whom they considered as their saviour. Already in the first and second century CE followers of Christ found others who tried to use Jesus his teachings for their advancement and who adapted it to their traditions. The Apologists defended against the charges because of paganism and Judaism and several like Hippolytus of Rome (170–235), the most important 3rd-century theologian in the Christian Church in Rome, opposed the trinitarian thinking. Flourishing in the fourth and fifth centuries the Donatists and other non-trinitarian groups continued to get believers who wanted to stay true to the Biblical teaching. The Tribunal of the Holy Office of the Inquisition (Spanish: Tribunal del Santo Oficio de la Inquisición), commonly known as the Spanish Inquisition (Inquisición española), established in 1478 by Catholic Monarchs Ferdinand II of Aragon and Isabella I of Castile to maintain Catholic orthodoxy in their kingdoms and to replace the Medieval Inquisition, which was under Papal control, did not manage to silence the non-trinitarian believers, who continued to form small groups which came together in each-others houses. Several of them also undertook the dissemination of Bible knowledge and circulated the Word of God in print, at the danger for their own life. In several countries brotherhoods were formed under different names, Apostle Brotherhood, Brothers of Christ, Brethren, Brethren of Christ, Anabaptists, Baptists (at that time still unitarians). All of them were convinced that the study of the bible should come in the first place. The churches which were later to be called Christadelphian initially resisted a denominational name. Throughout the USA and Britain these churches generally went by the names of Believers, Baptised Believers, the Royal Association of Believers, Baptised Believers in the Kingdom of God, and other similar names. They generally referred to each other simply as "believers". I'm unaware of any documentary evidence that they regularly called themselves "Brothers or sisters in Christ". Though throughout history there have been many sorts of brethren, we mainly use the name 'Brothers in Christ' for the followers of the English medic son of a Dissenting minister John Thomas (1805–1871) who went to America early 19° century. His family is reputed to be descended from French Huguenot refugees. When his father, like many people of that era, in 1832 made the decision to seek fresh opportunities Dr John Thomas agreed to go on ahead and prepare for the family to emigrate. He took the opportunity to further his career and accepted an appointment as ship's surgeon on the Marquis of Wellesley which was bound from St Katharine Docks, London to New York. The ship embarked on May 1, 1832 and immediately sailed into stormy weather that lasted the whole voyage. During one ferocious storm the ship lost the top of the main-mast and heavy seas stove in the bulwarks, washing everything moveable off the deck. The ship eventually ran into shallow water and ran aground off the coast of Nova Scotia. The ship was raised up by the waves on twelve successive occasions, each time the keel striking the sea bed with such force that both crew and passengers were convinced the ship would break up. Fearing that his life was about to end Thomas, determined to die with a prayer on his lips, prayed for mercy. He was very conscious of a void in his knowledge about what was to happen to him should he die. Thus he made a vow to dedicate his life, should he be spared, to religious study and to seeking out the truth about the matter of life and death. Aided by a change in wind direction, the captain's efforts to turn the ship back out to sea were successful and after one final bone-jarring grounding, the ship floated free. Thomas never forgot his vow and spent the rest of his life devoted to Bible study, determined to understand the true message of the scriptures. The Marquis of Wellesley docked in New York and Thomas travelled on to Cincinnati, Ohio where he became convinced by the Restoration Movement of the need for baptism and joined them in October 1832. He later came to know a prominent leader in the movement, Alexander Campbell who encouraged him to become an evangelist, spending his time travelling around the eastern States of America preaching, until eventually settling down as a preacher in Philadelphia, the largest city and busiest port in British America, and second in the British Empire, behind London. Thomas Campbell had disagreement on church doctrines, and branched out with the means of bringing restoration to the early church. With his study of the New Testament and belief in immersion rather than infant baptism, he affiliated with the Baptist Church. With tension brewing between Baptists and Campbellites, they eased out and was merged with the church of Barton Stone. The 25,000 strong movement was known as the Disciples of Christ, and at the turn of the 20th century had over a million Disciples. The Campbells tilted many from the formal religion to a personal faith setting the stage for the revivalist and fundamentalist movements. Becoming fascinated with Prophecy the Anglo-Irish Bible teacher John Nelson Darby who had chosen for an ordination as an Anglican clergyman in Ireland, held a series of conferences on the subject and his view of prophecy came to be known as dispensationalism, the prevalent teaching today, which explains God to have related to human beings in different ways under different Biblical covenants in a series of “dispensations,” or periods in history. Seizing the teachings of 18th century Chilean monastic Manuel de Lacunza, he taught a premillennial return of Christ(Lacunza also proposed that Christ would appear first to remove His faithful from the worst of the tribulation, before returning fully to establish His reign.) He also was convinced that the very notion of a clergyman was a sin against the Holy Spirit, because it limited the recognition that the Holy Spirit could speak through any member of the Church. He started a movement which was based at Plymouth and became known as the “brethren”, welcoming all denominations and serving without ordained ministers. His studies during this period of his life generated the foundation for many of the beliefs he came to espouse as a Brother in Christ or Christadelphians diverted from delphos (brother), delphia (city) and Christ, a title he choose to register the pacifists so that they did not have to go to fight in the American Civil War. In the "certificate" which John Thomas wrote for Samuel Coffman and "the brethren of Ogle County" (ten males in all) he refers to the Antipas Association of Christadelphians in New York as the publishers of a pamphlet called 'Yahweh Elohim'. He cites this as evidence that a denomination with the name "Christadelphian" was already in existence. The work of Dr Thomas attracted the support of others in America and Britain who were convinced of the truth of his conclusion. Together they formed the Christadelphian community. Since then, Christadelphian communities have been established in many countries all over the world. Those who had left the Restoration Movement like Thomas did in 1837, because he had too many different opinions with Alexander Campbell his teachings, and started following doctor Thomas often where also called Thomasites. For the Thomasites it became more important to follow the Bible, which they considered the inspired and infallible Word of God. From it they learned the importance of preaching, proclaiming God's Word they went across the country, where small bible Student groups started to grow independently. One of Thomas his students would found a bigger Bible Student movement which resulted in different groups of which later the Jehovah Witnesses became a very strong unitarian movement. The followers of Dr John Thomas want to imitate Jeshua from Nazareth (Jesus Christ the Messiah) and share the love with each other that Jesus had for mankind. Because they do not want to use violence, they object to military service but do not object to do the social service instead. The members of the Thomasites and Christadelphian community live by the Scriptures and together taste a great promise and await the second coming of Jesus on earth, who, they believe, will establish a theocracy with its centre in Jerusalem. The Brothers in Christ do believe Jesus should be their only head and high priest as cornerstone of the church which should be according the first century system of Jesus his disciples and therefore they have no ordained ministry, breathing and growing with no heir other than Christ Jesus, not wanting to minimize the power of God’s Force the Holy Spirit which shall be given to those God wants to have insight. Each member of the community has to clothe themselves with compassion, kindness, humility, gentleness and patience and readiness to share the Word of God and love of God with others. Robert Roberts (1839 – 1898), who at an early age showed huge devotions to the positions established by John Thomas, was able to carry the huge majority of the movement with him as he established ways to maintain it in those positions. In this process huge numbers were undoubtedly lost to divisions, making it that as a denomination on the basis of conformity of belief it is not so much known today. In many ways there are a huge number of similarities with the life of John Thomas in that it was a life of contentious debate. This time, however, much of this debate was in order to defend the positions established by John Thomas rather than create new positions and a huge number were with people who considered themselves to be part of the Christadelphian movement. His major system of organisation was written in a guide in 1883 called “A Guide to the Formation and Conduct of Christadelphian Ecclesias” and is largely the method still used today. 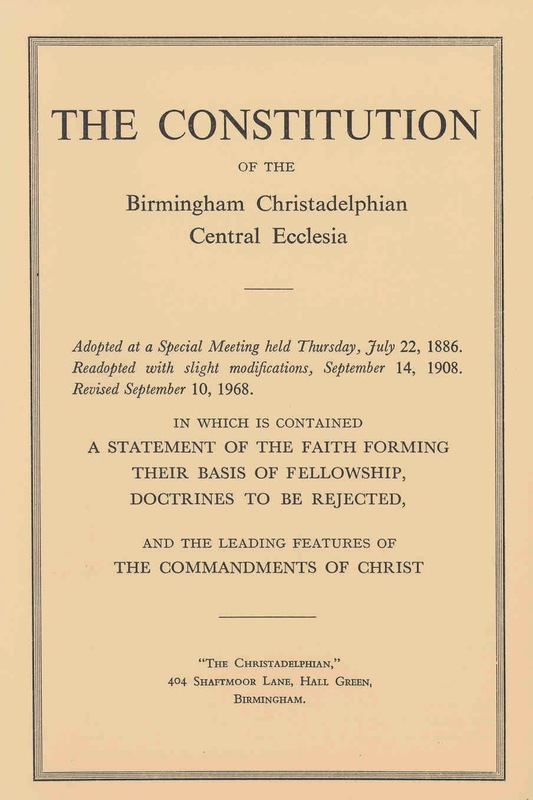 It is sometimes referred to in church disciplinary situations and in that sense can be considered to be the Christadelphian rulebook and procedures. Robert Roberts believed wholeheartedly in the “Ways of Providence”. He took special care over a series of twelve lectures for his ecclesia at Huddersfield (UK), and wrote them out in full, contrary to his usual practice of relying on notes. These lectures formed the basis for Christendom Astray, a book which has probably contributed more to the acceptance of the Truth than any other human work. Like John Thomas there was a strong rejection of any form of paid ministry and the form of organisation suggested has been a committee approach with names like “recording brother” and “arranging brother” and with voting, constitutions and statements of faith. Robert Roberts also established a principle that connection with other meetings should only be on the basis of stated agreement with a common statement of faith. In 1876 Robert Ashcroft (1842-1921), a Congregational minister, became a Christadelphian. Two years later he founded a chain of Young Men's Mutual Bible Study Associations to train young men in the methods of Bible study and public speaking (Mutual Improvement Classes have been a part of Christadelphianism for over a hundred years). By 1883 his standing as a Christadelphian was such that he was made assistant editor to Robert Roberts of The Ambassador of the Coming Age (started in 1864) which became The Christadelphian magazine in 1869. One writer described Robert Ashcroft in 1885 as having ‘more moral weight in the ecclesias than any living brother'. Roberts reacted badly to this adulation of his assistant editor. It would be difficult to say, over 100 years later, whether jealousy on Robert's part had anything to do with it; however, even in 1884 Roberts found it necessary to answer questions as to whether he was jealous of Ashcroft or not. 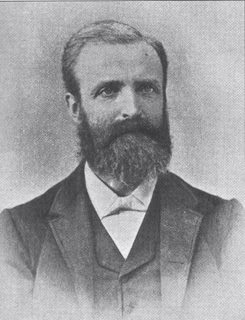 In September 1884 Ashcroft left Birmingham and his assistant editorship and started a magazine called The Bible Exegetist. Roberts announced Ashcroft's departure in his magazine and wished the project God-speed, saying he would rejoice in its success. Almost immediately, however, Roberts began what a contemporary brother described as a 'campaign' against Ashcroft. He accused him of teaching a 'partial inspiration' of the Scriptures and wrote lengthy articles in The Christadelphian attacking Ashcroft. Roberts "went to excessive lengths to defend his leader against a man who suggested that Thomas's views were not authorative" which resulted in the events of 1885 which have been known as the 'Inspiration Controversy' where the real issue seemed to be fellowship. The question of Ashcroft's views on inspiration were secondary. The primary issue was Roberts' dictatorial handling of the matter and whether any authority as spokesman for the whole brotherhood should rest on the office of editor of The Christadelphian. Many brethren objected to Roberts' heavy handed approach and his attempts to enforce his own views on the whole brotherhood by having them enshrined in a rigid Statement of Faith which had to be accepted as a condition of fellowship. 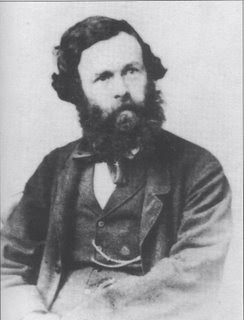 One of the prominent brethren in the 'Believers Movement' in Scotland was George Dowie (1824-1895), being persuaded of John Thomas's views by March 1853. For some years George Dowie published a magazine called The Messenger of the Churches (from 1858 to 1870) which circulated both in Scotland and England. Five years before Roberts produced his Golden Harp, Dowie published a hymn-book for the Believers in 1864. He also wrote and published other literature for the Believers and was regarded as something of a leader, especially among the Scots Believers' churches. Dowie disagreed with much of Thomas's interpretations, and presented an alternative view in his Messenger. Thomas made it clear to Roberts that he wasn't pleased. Relationships between Thomas and Roberts were already "frosty" (and Roberts refers to this in his autobiography). In 1864 Roberts wrote to Dowie saying that he no longer regarded him as a brother, and shortly afterwards there was a thawing in the frost between Thomas and Roberts. It seems that George Dowie died as a Christadelphian. 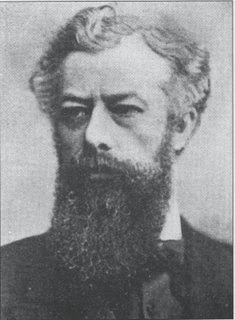 After the division in 1885 when many ecclesias broke free of Roberts' authoritarianism he joined an ecclesia not under Roberts control. In 1873, two years after the death of John Thomas, Edward Turney and Robert Roberts fell out over their understanding of the theological significance of the death of Christ. Roberts, without the ascent of his "managing brethren" or the Birmingham ecclesia (of which he was a member), unilaterally announced in The Christadelphian that he "withdrew fellowship" from Turney and all who held his beliefs. Turney's supporters eventually took the name "the Nazarene fellowship" and today several of them do no longer call themselves Christadelphians. The Nazarene Circular Letter published by them continues to this day with its main readership, apparently, being among the Christadelphian community, "many of whom quietly support it" according to one of its members. In his Thinking It Over (Birmingham, 1963) Ernest Brady, a previous editor of the Nazarene Circular Letter, noted from his discussions with Christadelphians on a private basis that "a large proportion of Christadelphians" were in agreement with Nazarene views. The big problem seemed to have been by Robert Roberts becoming increasingly authoritarian, and removing prominent brethren who refused to submit to his authority. It began with the disfellowship of the very capable leader George Dowie in 1864, was repeated in 1873 with the ostracism of the successful preachers Edward Turney and David Handley and their supporters, and came to a head with the excommunication of the popular speaker and writer Robert Ashcroft and the 1885 division. It was clear to many Christadelphians that Dr. Thomas simply couldn't have found "the whole truth" (as if any man could!) what Roberts propagated and the more Roberts elevated Thomas to the status of discoverer-and-revealer-of-all-truth the more other brethren questioned it. 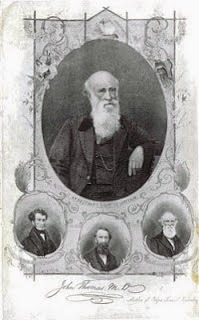 Between 1864 and 1885 there were at least 6 divisions within the Christadelphian denomination, including the major divisions caused by the disfellowships of George Dowie in 1864, Edward Turney in 1873 and Robert Ashcroft in 1885. Other 'minor' divisions (although not minor for the individuals involved) included the following. The controversy which followed Robert Roberts' withdrawal of fellowship from Robert Ashcroft divided the brotherhood for nearly 70 years, and its repercussions are still being felt. Today we can find the main streams: Amended Christadelphians (including the Central Fellowship, with a.o. CBM members), Unamended Christadelphians, Antipas Association or Antipas Christadelphians, Nazarene Fellowship, Nazarene Felowship, Nazarene Friends, Bereans or Beran Christadelphians, Dawn Christadelphians, Carelinks, Restoration Church, Restoration Fellowship, Church of Abrahamic Faith, Church of God of Abrahamic Fatih, Liberal Christadelphians, Free Christadelphians, Christadelphians for Unity, Christadelphian Biblestudents, Maranatha Christadelphians, Nasu Christadelphians, Remnant of Christ's Ecclesia , Republic Christadelphians, and many smaller groups like Old Paths. The first statement of faith used in this way was called the Birmingham Statement of Faith because that was the statement formed by the congregation he was a member of. Whilst undoubtedly Robert Roberts his devotion and personal characteristics played a part in organising the movement, there was an advantage also in that he was a reporter and edited the principal magazine of the group. This was initially set up as “the Ambassador of the Coming Age” in 1864, but prior to the death of John Thomas it was renamed “The Christadelphian” in 1869. It has been the nearest thing the community has had in terms of central organisation, although it has never officially had any formal authority over individual meetings. Almost all baptisms, deaths and important events were noted within a section in the magazine and a huge amount still are. The Bothers in Christ believe in the Divine Creator, the Father of us and Christ in heaven Who is one, the Father alone (1 Corinthians 8:6). There can only be one true God. It is undeniable that Jesus referred to himself and the Father as separate. God stands alone and unrivaled in the universe, the source of all good and evil (Isaiah 45:5-7). The Brothers in Christ or Christadelphians reject the idea that the devil is one of Gods' angels that was permitted to rebel in the very heavens (thy will be done on earth as it is in heaven) and now wrestles with God for control of the world. They likewise reject the idea of a God with multiple independent personalities as not being in harmony with the teachings of scripture. For them there is no three-union god or a Trinity. The Christadelphians believe that the covenant of God with Abraham laid the framework for our hope. To Abraham and his descendants was promised the world as an inheritance (Genesis 26:3-4 [to Isaac], Romans 4:13, Psalm 37). Hebrews points out that Abraham received nothing, and that the covenant will be fulfilled in the resurrection (Heb. 11:39-40). They believe then that the literal earth, restored and renewed, is the inheritance of the Abraham and his descendants in faith. While awaiting this inheritance, all await resurrection in the sleep of death, where there is no consciousness (Psalm 146:3-4, Ecl. 9:10). According to the Brothers in Christ god has a Plan with the universe. Man's plans are prevailed by God's purpose. In this plan of God God's work done in God's way will never lack God's supplies and human beings shall not be able to destroy or make it impossible that Gods purpose shall succeed. Some two thousand years ago there was a Jewish Nazarene preaching in the regions around Jerusalem. The man, born in Bethlehem on the 17th of October -4 CE in the tribe of King David, was the son of the Essene girl Miriam (Myriam/Mary/Maria). Belonging to a family belonging to the 'sect' of Second Temple Judaism the son of man Jeshua (Yeshua/Yahushua/Yahshuah/Yehoshua/Joshua/Issou/Jesus/Chesu/Jezus) learned the Torah thoroughly and learned to have a good relationship with God and with all the believing members of the community. Knowing the importance of Reading the Scriptures, in his public life, which lasted only three years, Jesus as a rabbi thaught from those words form the old scrolls, the Hebrew Bible and gave the advice to the people to return to Holy Scriptures out of Fear of God and not to wait until it would be too late to change their life. Jesus, who would change history of humankind, knew how the God of Abraham had chosen Him a special people for Himself. Jesus was well aware of the meaning of the promise his God had made to Abraham and his descendants that through them would come a redeemer who would bless all nations. The Jews, Israel, looked forward to the coming Messiah (anointed one) and hoped the Immeasurable Grace would soon bestowed on humanity. Jesus was very clear in regard to the spiritual authority God had bestowed upon the Jews by whom salvation would come over mankind. (John 3:22) He only wanted to follow the Will of his heavenly Father and to be a Servant of his Father. This son of God selected some ordinary people to follow him, becoming his disciples. It took a long time before those followers of Christ Jesus came to understand what Jeshua his role in this universe is. It also took more than three years before they came to see what the Nature of Christ was and how they had to play a role in his assignment. They were commissioned to go out into the world to spread the message of the Good News of the coming Kingdom of God, and to build a nation for Christ. Jesus taught about the Will of his heavenly Father and how we should comply to it. But he also demonstrated how we should live and how we should act in this life. For the apostles it was clear that Jesus set an example for us we should follow. They also came to see and understand how God His Message became clear in Christ. The Creator and Speaker God had given a Book about Prophecy in which stories of man were told, but where the Voice of God gave us advice, guidance and promised to those who wanted to follow His Commandments. Jesus followed the Voice of God and wanted from his followers also to follow this Voice plus the Inerrant Word of God and not as much the voice of the words of the world. Jesus learned his disciples where to look for the better things which were going to be provided by the Creator. Followers of Christ do not have any reason to be constantly Looking to the East and the West for Truth. Jesus is the Way. Jesus and his disciples lived on this earth in this world, but that does not mean they were of this world. We can not escape our position in this world but Jesus taught we should make the right choice and choose for God and not for the world and not belonging to her. That should not mean we are not allowed to enjoy some pleasures of this world. We only have to be careful how we come in a position whereby we can be feeling-good, and we should search for happiness and the church or community of like minded souls. Jesus wanted people to know and to see to whom they wanted to be enslaved. Together we should embrace the hope of resurrection to eternal life at the return of Christ. The Brothers in Christ believe that this will take place soon, but on a date nobody can exactly tell, because even Jesus did not know when he would return. At that time the kingdom of God will be established from Jerusalem, growing to encompass the whole world, offering freedom, hope and salvation to all mankind. The people of Israel, as the literal descendants of Abraham, having a special place in this kingdom. The apostles came to see man had to go for the Only One True God of gods and should try to become like Christ Jesus, one of spirit like Jesus also was one with God. To become one with God should be our aim and all those who have chosen to follow Christ can be taken up by their baptism in the circle of the new born Children of God. As children of God they are also brothers and sisters of each-other and of Christ. Being a child of God, men and women, feel united under Christ in the knowledge that all things are open to the sight of Him who created us. As brothers and sisters they want to be there for each other, always prepared to help each other in good but also in bad times. Brethren in Christ dare to take each-other like they are born, no matter which colour they might have or which shortcomings there might be. They do not want to deceive themselves nor others, in the knowledge that the Elohim Hashem Jehovah God sees all. In the knowledge that our every thought and action is known to Him, the Most High, they want to help each other to go in the best way on the path to God, Who knows our frame, our sorrows and joys and our motives. Brethren in Christ do want to comply to the commandments of God and hope to bring others on the right road as well. To do this they need their love, which may be feeble and faith which might also be frail, yet mercy triumphs over judgement (James 2:13). Brothers and sisters in Christ want to go strong in their unity for Christ, truly loving Jehovah their God. They also want to help each-other so that everybody can grow in spiritual knowledge, having a living and active faith holding fast to that which is good. (Psalm 139:1-4) They know that to live the full life they shall need to experience the fullness of God. Believing that the Bible (66 books) is the inspired Word of God, complete and self-sufficient to instruct us in the way of salvation, the Brothers in Christ (men and women) do find it important to read and study those books daily and to come together regularly to share that Word of God. This gathering with the knowledge that Christ should be our anchor and our focus. Brothers in Christ are people who do want to meet with each other in equality and of the same mind with the understanding that people might think differently over certain things. They do not believe that any Brother or Sister, any belonging to the delphos (brothers) or delphia (city) of Christ or Christadelphian community, the Christadelphia past or present, has received any type of special revelation. It is only through sustained and prayerful reading of the Scriptures that they come to an understanding of the purpose of God in their lives, and how He would have us conduct ourselves day to day. For this reason the Brothers in Christ are willing to be patient learners of the Word of God and to let this Word give them power to change. 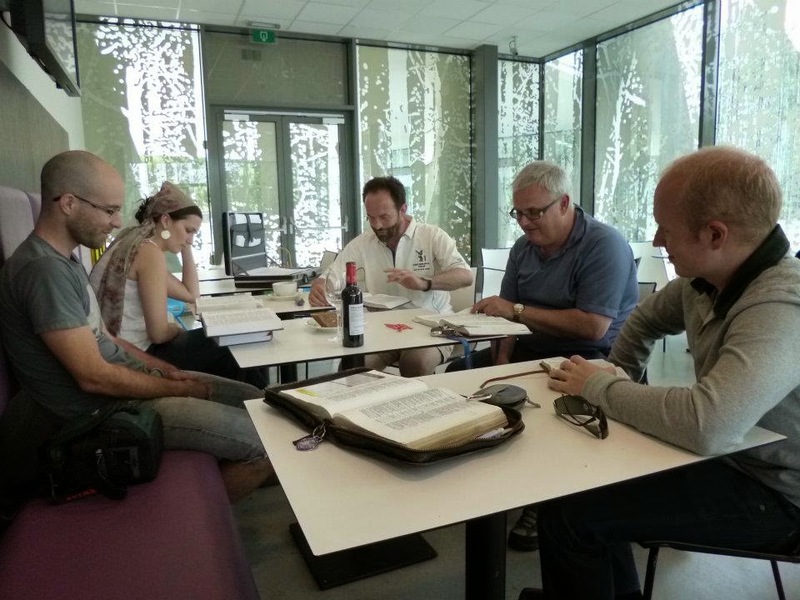 Meeting regularly or to Congregate, to gather, to meet as disciples of Christ counting lives and friends dear to them, they want to give their knowledge they received from their study to others without asking something in return. In remembrance of the Blood of life, the death of Christ, they want to assemble all the congregation of the children of Israel and feel united under Christ with other believers all over the world making church, breaking bread and drinking wine as symbols of the flesh and blood of Christ given for all sinners or 'children of disobedience'. They all want to live in obedience and therefore want to help to edify each other and provide exhortations or sermons for the community so that all can learn. Having no central leadership the communities of the Brothers in Christ work independently, but may associate with different main groups in the world, like the Amended- or Un-Amended Christadelphians, the Central Fellowship or Liberal or Free Christadelphians or with Old Paths or with Christadelphian Biblestudents. The highest level of organization is the ecclesia (i.e. local church) which is typically led by a rotating selection of the more mature members. It is their distinct beliefs and dedication to hospitality that have enabled them to survive as a separate community, though in most places they are quite thinly spread. Communication is sustained between ecclesiae or ecclesias through much travel, mail, and several magazines which publish not only articles, but also ecclesial news and announcements of ecclesial study days, fraternals and young people's gatherings.